The emphasis on energy efficiency has created an environment where air doesn’t flow as well as it does in older houses. Moisture mixed with poor ventilation and stagnant air can encourage the growth of mold and mildew. It’s important to learn ways to prevent mold in the home. Mold not only causes structural damage to homes, but it’s also a health hazard. Those with allergies, asthma, or other lung conditions suffer the most from the presence of mold. Mold spores float through the air and land on objects in the home to spread. Read on to learn how to spot mold and what to do to prevent it. Mold is a fungus that needs moisture to live and feed. It grows on everything from food to cloth, from wood to wallpaper, and from furnishings to cardboard. Mold comes in colors from deep blue to brown to yellow and black. The good news is that there are ways to prevent and remove it. Mold needs moisture to grow. Ways to prevent mold in the home begins with checking the house for leaky windows, excess moisture from air conditioning vents, and in the bathrooms. 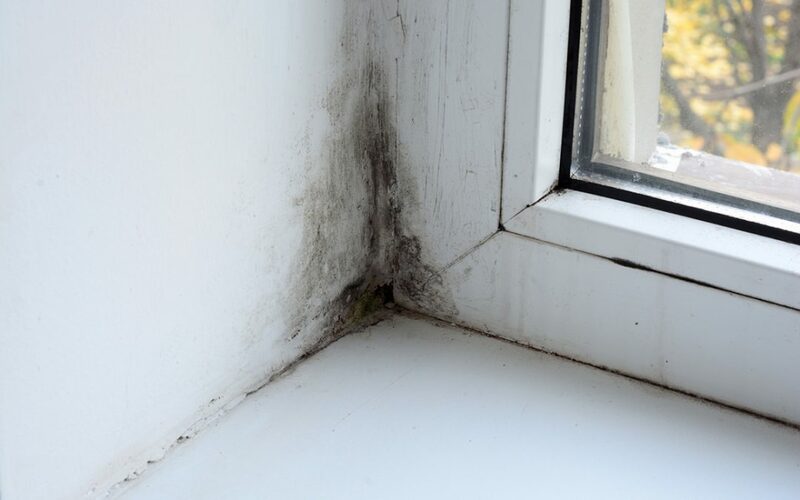 Mold will grow on the window frames, spread down the wall, settle onto the baseboards, and travel out onto hardwood floors or carpet, all of which result from leaky windows. Excess moisture from steam after showering in the bathroom can also seep into the drywall and insulation. The bathroom is a common place to find mold growth. Bathrooms should be well-ventilated. Leave the door open or open a window to vent the steam during and after a shower. Wipe down the walls, window frame, and door. Check for leaks beneath the bathroom cabinets. Ideally, humidity inside a home is around 20 to 40 percent. Mold needs at least 60 percent humidity to live and grow. Dehumidifiers pass air over coils, removing the humidity from the air and passing it on as drier air. Removing the moisture from the air is an important way to prevent mold in the home. Use fans to increase ventilation and supplement the dehumidifier. Another way to prevent mold in the home is thoroughly cleaning or getting rid of any existing mold so it doesn’t have a chance to spread. Throw away mildewed shower curtains, carpets, and drapes. If you spot mold growing on any surfaces or walls, scrub it with a bleach and water or a borax solution immediately. If you suspect a more deep-seated mold issue, it may not be healthy or safe to try to clean it up yourself. Contact a mold inspector and follow their recommendations. Veriguard Home Inspections offers mold inspections and other home inspection services to Northern New Jersey. Contact us to book an appointment.